Passing through Kootenay Bay? Interested in seeing one of the longest running spiritual communities in North America? 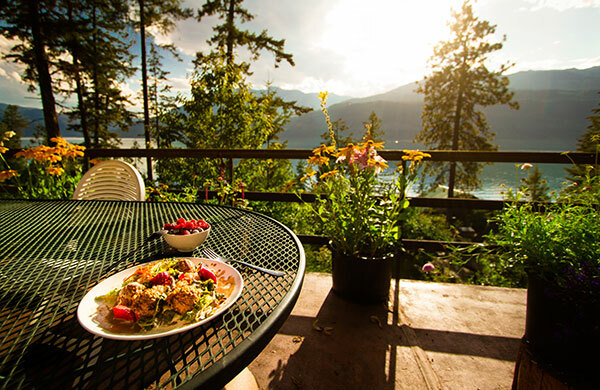 Want to have a delicious lunch overlooking Kootenay Lake? Day visitors are welcome year-round! Take a self-guided tour. Shop in our beautiful Gift Store. Enjoy a nutritious lunch, served daily at 12:30 pm. Please call ahead to let us know you are coming – (250) 227-9224! Register at Mandala House, where we are happy to answer any of your questions and give you a site map. Open every day from 9 am to 5:30 pm. Our Gift Store features spiritual books, jewelry, cards, shawls, journals and more! Open daily. Directions: Minutes from Kootenay Bay ferry & Crawford Bay. Turn from Highway 3A onto Riondel Road. We are 3 kms away on Walker’s Landing Road. You are invited to be part of the Ashram for this program that gives a taste of this special community. 11:15 – 12:15 pm – Hatha Yoga class. We supply yoga mats and blankets. Children and adults are welcome. The class is open to all levels. Children who can participate and be attentive in the class are welcome. 11:15 – 12:15 – Hatha Yoga class. We supply yoga mats and blankets. Children and adults are welcome. The class is open to all levels. Children who can participate and be attentive in the class are welcome. (shared accommodation). $25/ ages 6 – 18 (with accompanying adult). Free for children 5 and under. Private rooms may be available for $50 extra. $25 deposit (See our Cancellation Policy). Includes shared accommodation, three meals daily, morning hatha, retreat/workshop, and evening satsang. New! Bring a friend and both you and your friend will receive a 15% discount. *For travelers coming from within BC who are on Pacific Standard Time, including the Nelson area, please note that the Ashram is on Mountain Standard Time from November 4, 2018 – March 10, 2019. Mountain Standard Time (Alberta time) is one hour ahead of Pacific Time (BC time). From March 11, 2019 until November 3, 2019 the Ashram is on Pacific Standard Time.